One of my favorite childhood memories is watching The Jetsons on Saturday morning and dreaming about the day we would have flying cars, robots as maids and a home you could control with the touch of a button. While flying cars and robots doing our laundry still seems kind of out there, a home you can control with a touch of a button is not. I’m talking about a smart home, a home that’s connected and one you can control via your smartphone. I had the chance to chat with Brett Worthington, SVP of Wink, about what a connected home is, if it’s affordable and the simplicity of set up. This concept has been very intriguing to me since the day I heard about it, but it seemed a little out there for me to achieve and possibly something for only the rich and famous. After talking with Brett, I found that even the average home owner can set it up and even afford it. It’s about those everyday products that can be connected through one app. With one simple app, you can control anything that’s around you. With literally the touch of a button you can turn your lights on, you can have your window coverings come up and down, you can even detect a water leak in your basement. How does the connected home help us stay safe? This is such a great value to the consumer because these devices have the ability to monitor your home when you’re away, as well as when you’re at home. While you’re away, you can actually view all of the activity that’s happening at your home through a camera. You can set up a text alert for if motion is detected. You can also use this while you’re at home. For example, if you wake up in the middle of the night and you want all of your lights on, or for when you’re going to sleep, you can press the ‘all off’ feature. That makes sure the garage door is shut, the door locks are locked and the lights are out. It’s convenient and it also gives you some comfort. Is having a connected home expensive? 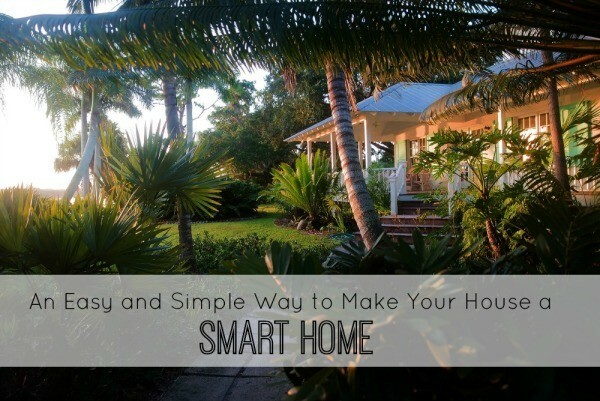 It used to be expensive, but now you can get started and set up your smart home for under $100. You can purchase lighting controls, smoke and carbon monoxide detectors. Not only is it more affordable, but the set up is so much more simple. It’s as easy as installing it and following the instructions in the WINK app. Is it really that simple to set up? Brett says it is. Their average customer even includes people who aren’t tech savvy. These are products your average home owner is used to using. You set it up through your wi-fi connection and your phone, and it really is simple. Where can we get more information on setting up a connected home? You can go to wink.com, as well as the lifestyle applications. Do you have a connected home? Have you thought about setting one up? I love the idea behind it and realize now how accessible it is.